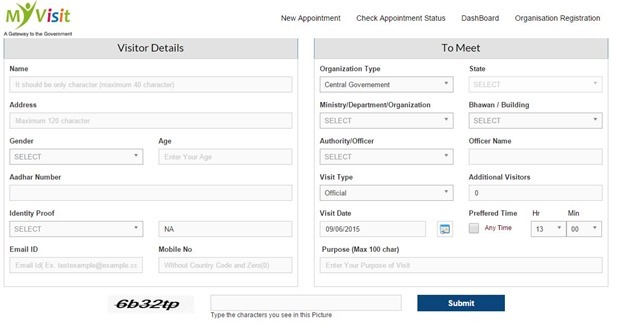 MyVisit.Gov.in, Getting Appointment With a Govt Officer Is Just A Click Away! It’s quite pleasing to see the rate at which various Government services and functions are coming online. In yet another online initiative, Government has launched a portal that will facilitate any citizens of India to book appointments online with Government officers from any state and central department.. Trying to get a meeting with a Government officer is one of the toughest task for most ordinary citizens. And, if the officer in question is a senior bureaucrat, it is next to impossible. You need to go through hoops and wait for countless days to meet them. But, that is now history! MyVisit.Gov.in facility enables the citizens to have a smooth and simple process of making an appointment. It will bridge the gap between the Government and the common man and will enhance the opportunity of a common man to meet a government officer, hassle free. The registration for this service requires Aadhaar card number, so you will need that before you start the registration process. Here are various steps involved. The appointments can be sought for personal as well as official meetings. This portal can be used by ordinary citizens as well as Government officers to seek appointment! So, next time you want to meet a government officer, remember, they are just a click away! 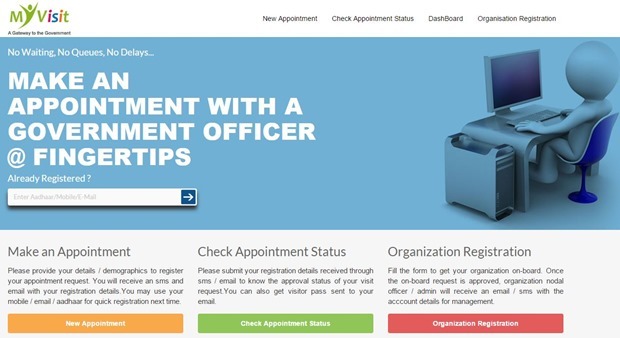 "Now, Getting Appointment With a Govt Officer Is Just A Click Away! ", 5 out of 5 based on 1 ratings.